← Do We Doctrinally Program People? Fresh from the Presbytery of Chicago Clergy Retreat, I’m chock full of ideas and questions that will probably show up in the next couple posts here. Keep serving the Church as it is until everybody dies? Serve two churches at once: one of those born into it and then start something new that’s emergent? This is what I spent over twenty years of my life trying to figure out a few years back. My young colleague figured out that This is the Question after being ordained less than a year. May all our young pastors be so adept at reading church culture. In the throes of relentless sermon preparation, pastoral care, meetings, and administrivia – not to mention random congregational triage – it often takes a retreat to help us recognize the bigger picture. I remember coming back from retreats as a parish pastor having a better sense of where we needed to go. But the challenge was figuring out how to convey that information to others in a way that helped them understand and then shift. People born into the church are basically content or don’t even realize that church could be different/more inspiring/more fun/more meaningful. We are exhausted at the very thought of being the pastor of two churches – one that is content to do what’s familiar and personally comforting and another comprised of people who find church to be unfamiliar, discomfiting and irrelevant. Seminary didn’t teach us How to Shift a Congregation into the 21st Century. And even if we are Master Shifters, most of our people don’t want to go there in their heart of hearts. I am so hopeful about The Church of Jesus Christ. As we figure out how to be the Future Church, we are doing what generations of believers have done before us in different contexts and cultures. I’m thankful that it won’t take my young colleague the next 20+ years to figure things out better than I did. 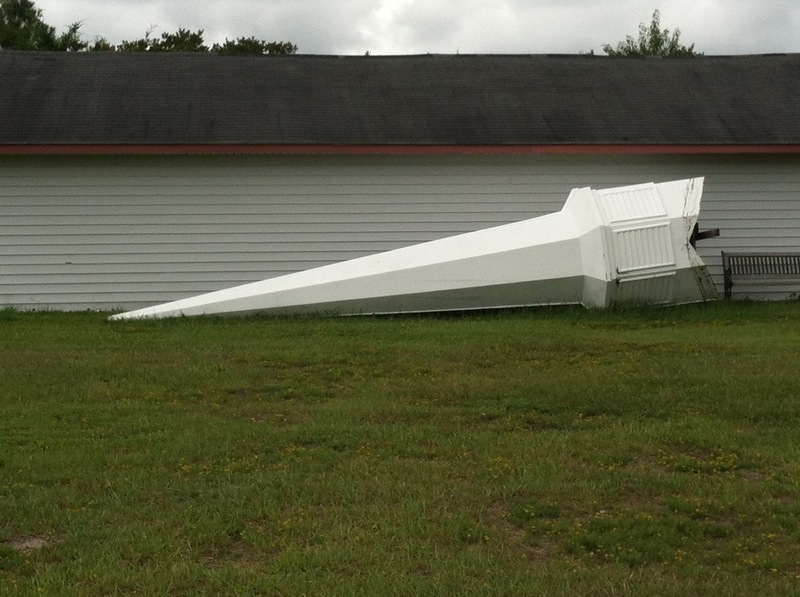 Photo of a toppled steeple in coastal NC we saw on vacation last year, and the year before that, and the year before that. They just don’t want to put it back up. Or they don’t have the money to put it back up. Or maybe they want to get rid of the steeple, but don’t have the heart to toss it. Or maybe they are just paralyzed. •	People born into the church are basically content or don’t even realize that church could be different/more inspiring/more fun/more meaningful. A. What makes you think that the church isn’t inspiring/fun/meaningful to many in a congregation? Have you asked them? One of the issues is that we don’t ask them! •	We are exhausted at the very thought of being the pastor of two churches – one that is content to do what’s familiar and personally comforting and another comprised of people who find church to be unfamiliar, discomfiting and irrelevant. A.	Yoke churches together. One traditional, one emergent. Two Pastors, congregations free to go to either. •	Seminary didn’t teach us How to Shift a Congregation into the 21st Century. And even if we are Master Shifters, most of our people don’t want to go there in their heart of hearts. A. Exactly. By yoking, that allows people to do either as they feel the Spirit. If the congregation is large enough you can have this exist in a single facility. I don’t think Pastors are the issue – We need multiple types of Shepherds! Some have taken years to arrive at their spiritual comfort zones and resist the push to move forward into the emergent church. But catching the vision of it prepares the slow moving spirit..keep at it.